The Ram (and Two Sheep) There are some familiar animal themes running through various cities in Australia when it comes to their major city public sculptures. For example: Perth has its kangaroos and Adelaide has its pigs. In Canberra, the capital centre of Australia, it has a ram and some sheep sculptures (amongst many other sculptures in its Civic Centre). 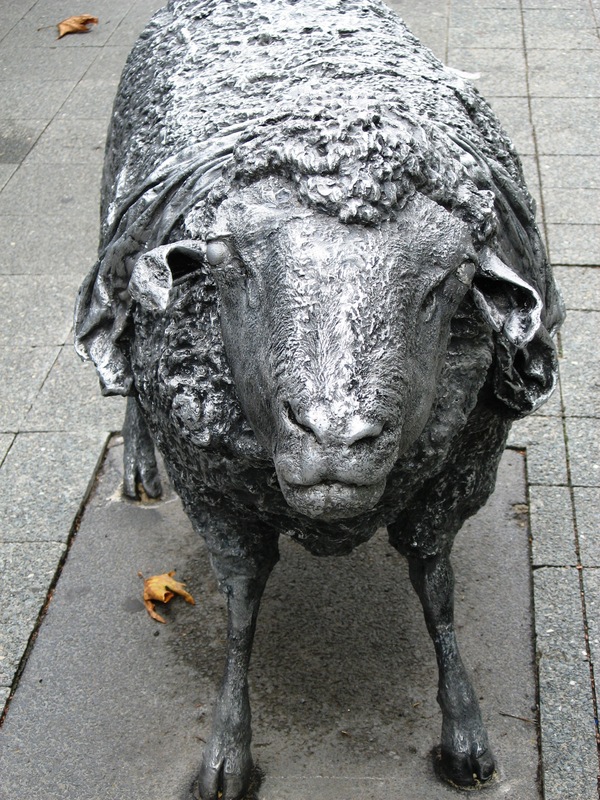 These bronze sheep/ram sculptures are designed by Les Kossatz (born 1943) and part of his work entitled “Ainslie’s Sheep” (2001). His works were inspired by an early Australian pioneer, James Ainslie, who was a manager, employed on the large former local “Duntroon” Station, to look after a flock of sheep. Over a 12-year period, they “flocktuated” in numbers from 700 to 20,000 sheep. No wonder there is a well-known Aussie phrase which says that: “Australia was built on a sheep’s back” – May I say: “Baa none – I agree“. Another series “Coming and Going” (2002) is located in the gardens near the National Gallery of Victoria, in Melbourne. For more examples of Sculpture, see this page. This entry was posted in StreetArt and tagged #Canberra, #PublicArt, Les Kosatz, rams, sheep. Bookmark the permalink. 1 Response to Baa none. I agree!